Bea Lewis is a retired educator with a Master's Degree in Education Leadership, along with 36 years of experience. She began her career as an Exceptional Education teacher, then a middle school administrator and finally the Hearing Officer for Duval County Public Schools. She's had thousands of conferences with students, parents, teachers and school personnel and as Hearing Officer oversaw fair and impartial proceedings of student disciplinary infractions. Her other responsibility was to present expulsion hearings to the members of the School Board and Superintendent. She conducted seminars with teachers, district and school based staff for many years with a training manual she created entitled, Processing Student Code of Conduct Violations. Bea produced a Training Module entitled, "Conversation Techniques for Difficult Parents, Students, Teachers and Administrators," which identified the twelve personality types, along with step by step strategies to conduct effective and non-confrontational conferences. She presented it at the Achievement Gap Conference in Chicago, Illinois, The International Association for Laboratory Schools Conference at Florida State University in Tallahassee, Florida, and most recently at the 2015 Teach Conference co-sponsored by public TV station WJCT and Community First Credit Union in Jacksonville, Florida. She has also taken this training to several local charter schools in Duval County. These experiences have led her to be a special guest panelist at Jacksonville Youth Leadership Conference, Inside the System. She was also nominated to participate in the Office of Justice as a Program Reviewer. Using her skills as a Toastmaster, along with the diverse understanding of the behaviors of students, parents and others in our schools has also given Bea the opportunity to address various churches and community organizations. Her direct "keep it real" style allows her to speak from the heart with conviction and authority to impart wisdom and common sense advice has made her extremely credible in her work. Bea has written her first book entitled, Really? 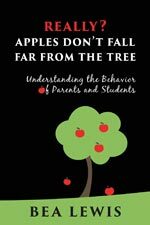 Apples Don't Fall Far from the Tree-Understanding the Behaviors of Parents and Children, which are real and relatable stories of her encounters with the 10 percent of personalities that monopolized 90 percent of her time.